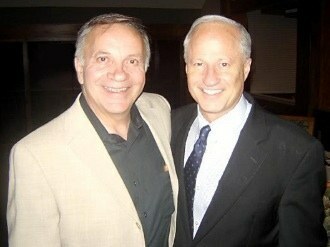 Tom Tancredo, Mike Coffman in happier times. Lots of discussion continuing today about last week’s ad from embattled GOP Rep. Mike Coffman of Aurora, in which Coffman declares he “doesn’t care much” for Donald Trump–an ad followed up by multiple news reports clarifying that no, it doesn’t mean Coffman won’t vote for Trump. At this point, Coffman’s ambiguity on the bottom-line question about this ad has been seen by many more people than will see the original ad, which calls the whole exercise into question in terms of Coffman inoculating himself against a likely anti-Trump wave at the polls this year. But there’s another side of the equation as well: by publicly dissing Trump, even without specifically saying he won’t vote for Trump, Coffman risks angering a substantial portion of the Republican base in CD-6–without whom he cannot reasonably expect to be re-elected. Coffman’s advisors have obviously factored for this in their planning, and determined that the benefits of distance from Trump outweigh the risks to Coffman’s base coalition. Apropos, this weekend Coffman took heavy fire at the pro-Trump conservative site Breitbart News by none other than his own predecessor in Congress, conservative lightning rod former Rep. Tom Tancredo. Congressman Mike Coffman on Thursday released a paid television ad attacking Donald Trump but saying he may hold his nose and vote for him. Here’s a news flash for the Post’s editorial board. If Trump were polling well in Coffman’s District, you would see and hear only glowing praise for The Donald from the political chameleon, Mike Coffman. Coffman’s ability to thread the political needle in recent years is legendary. But this time, he may well have outsmarted himself. NEWS FLASH: Colorado Pols promotes Tom Tancredo…? Hard to believe, isn't it…? seems to be no bottom in that vat of stupid….. This is exactly what I've been telling people. Coffman loses more support than he gains by shitting on Trump. This will be a net loss of votes and could cost him the race. But will all of these Republicans who are hacked off at Coffman actually vote for Carroll; or might they undervote this race? If the Repubs sit out the election, net gain for Clinton, Bennett and Morgan. I'm all for it.